Garage Organization By a Newbie #4: Progress, or Setback? I had one partial gallon-sized bucked of joint compound from some time last year (or was it the year before? ), but it certainly wouldn’t be enough to complete the entire garage, so I went to the store to get one of those big honkin’ buckets. I prefer the pre-mixed stuff because, well, I’m an amateur, and pre-mixed means less work and less chance for screwups! I needed to get paper tape anyway, because apparently Wal-Mart only carries the fiberglass stuff. After wandering back and forth across the whole store a few times (apparently they rearranged their layout a bit), I had everything else I needed and was faced with the decision of regular pre-mixed joint compound, or lightweight pre-mixed joint compound. There were no prices posted, so my first inclination was to go for the regular stuff. Then I picked up the bucket with my one free hand. Oh man. I think it said 63 pounds. I hastily set the bucket back down (“dropped” is more like it) and went for the lightweight stuff. The weight of this one wasn’t listed, but it was substantially lighter than the first so I quickly waddled my way to the register. Okay, I slowly waddled, because for whatever reason they put the bulk buckets at the back of the store, and the small project buckets near the front. That’s a looong walk with all that weight dangling from one hand and nothing to counterbalance on the other side. Anyway, on another day I probably would have stuck with the regular stuff, but quite frankly I didn’t want to look like a complete idiot, struggling to manage a 63 pound bucket, a 20×20 furnace filter, and a few miscellaneous odds and ends—all without the help of a cart, basket, or bag. So I settled for looking like a mildly amusing dork instead. After fighting my way through the check out interrogation (“Did you find everything okay?” “Do you have everything you need?” “Joint compound, eh?” “Do you need any drywall with that?” etc. ), I headed for home. A little harrowed, perhaps, but ready for work! With the worst of the old tape already removed and the resultant “tracks” sanded down, I decided to wipe off the excess dust using a wet bath towel. It worked a little too well. The towel acted almost like a sanding sponge itself, as it cut right through even the dried mud in short order. I backed off a bit, but hopefully removed enough of the dust. I went back in the house to find my drywall knives. Apparently I never got around to filing down the corners when I bought them last year, so before using them I had to hunt down my Dremel and a grinding wheel. After a few minutes (and lots of sparks! ), I had nicely rounded corners. 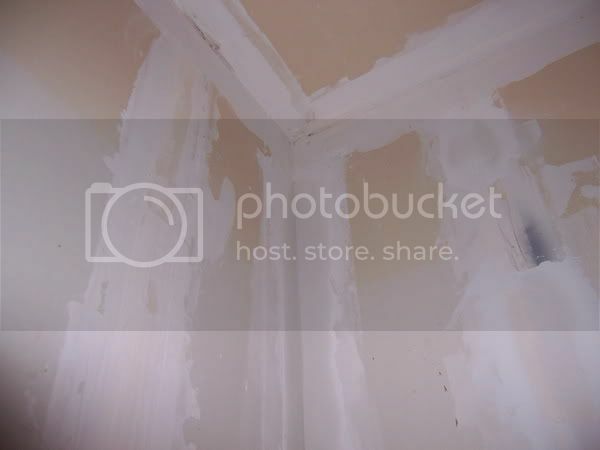 I do this with my drywall knives to prevent any chance of gouging the walls with a corner, and to lessen the amount and severity of sharp lines that can occur when smoothing wet mud. With newly-rounded corners, I set to work! Rather than break into the new bucket of mud, I decided to use the old stuff first. Problem #1: the lid was not on tight. I don’t think it has been open too long because it seems like I recently took a peek to make sure it wasn’t dried out yet, but I’m not sure how long ago that was. Problem #2: this stuff stinks! I didn’t let this stop me, because I remember joint compound always smelling bad. I didn’t think it was this bad, but it’s been a long time since I’ve used the stuff, and this particular bucket is a different brand that I only used for one tiny little piece, so I didn’t question too much. After all, it wasn’t dried out so it must still be good, right? Right?! Hmmmm….. I went ahead and started mudding/taping the walls. I decided to use paper tape instead of the mesh, so the first thing is to slap a bunch of mud on the joint. After a few moments of this I started seeing problem #3: gray streaks. I thought to myself, “that’s odd”, but kept going. After doing more, it seemed like the streaks came from my drywall knife. There are a few corroded spots here and there (it’s a cheap knife), but I didn’t think it could possibly cause this much streaking, so I pushed on. The gray streaks kept coming, and in fact I had the impression that they intensified the longer I went. I really didn’t understand what was going on, but the mud applied normally, so I went ahead and finished the taping. Here is what some of the joints look like. Of the areas shown below, I replaced the tape from floor to ceiling next to the door, almost all the way to the ceiling in the corner, and a small segment at the far top above the dark gray spray paint. After cleaning up and coming back in the house, I got to thinking about those gray streaks in the mud. A little Googling tells me that it might be mold. I had no idea this stuff could even get moldy! 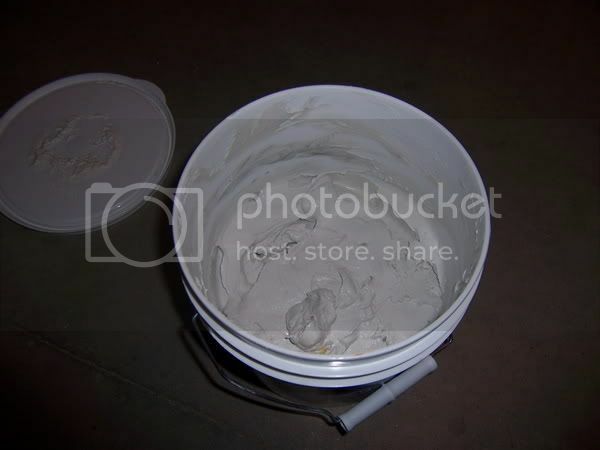 Nothing looked like mold to me, but I’m no expert, so I went out and took some pictures of the bucket. What do you think? In the meantime, I have to decide whether to continue using this old bucket of mud, or throw it away and crack into the new one. have one son who is builder and one worked for lumber yard. one at lumber yard had to open bunch of buckets and check for mold, sent bad ones back. 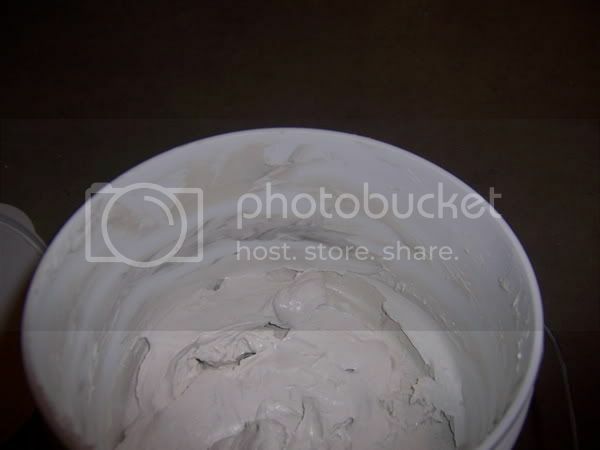 I opened old bucket of mud and other son said we had to throw it out because of mold. Not sure what it looks like you have but know mold is bad no matter where it is. Yeah; with Jim and Woodnewbie here, return it; I’ve done what Photoshop will let me with your pics; and can’t get away from mold. I’d return it. Looks like mold. well, Cy I am soo sorry to hear that you did all that work and have to tear it down again. The foul smell should have raised the red flag, I have had the same, ahem, problem. The problem with mold is that it can be downright dangerous to your and your’s health, especially it can cause respiratory diseases and some rather nasty complications. 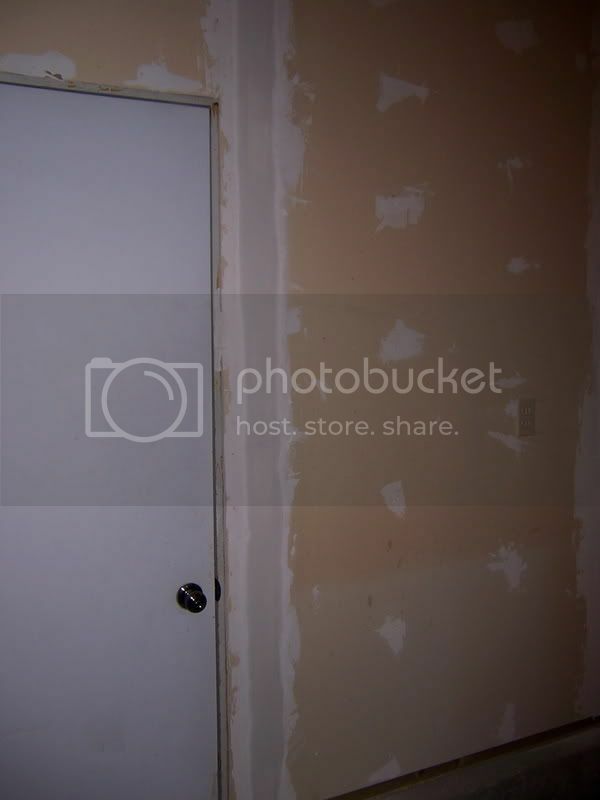 This will kill any residual mold that you inadverdently trasfered to your dry wall. Let it dry thoroughly before starting your patching/jointing operation. And for the love of God wear a mask when you’re doing this, you don’t want to inhale any dust coming out of that wall for the reason stated above…. Have fun and be safe…. Oh, Crap. I had mold in my basement, walk out style so it had a lot of wafer board. You don’t want to know what I went through for mold remediation. Take Jerryz advice. You probably want to think about long sleeves and full length trouser that get washed with bleach at the end of the day. hey,cyborg every one’s posting is right it’s mold. you got to get it off the wall. i would use a spray water bottle wtih a little bleach and wet the mud liberly and scrape it off with your 6” knife. buy American mud and not products made in china. look to see if it is made in china? i’ve been a taper for over 30 years and never heard of anybody grinding there corners off. you need them in the right angle corners. and any pipes comming thru the walls; with your 6” knife, let dry,Lightly sand #220 screened paper cloth any lap marks. apply 2/nd coat with an 8” knife. you really should use “topping mud” for the second coat but money or how detailed of a job you want to do, you can use the all purpose, it just shrinks more do to the glue inside. any questions email me back. 1) Get rid of that old bucket, right now. 2) Get rid of the mud you used from that bucket this time. Doordude described perfectly how to do it! 3) Never buy more mud than you really need, or at least, don’t expect to be able to keep it forever. 4) In the store, whenever you buy a new container, open it up and make sure it isn’t mouldy. I’ve had horrible luck with batches, occasionally – all of the buckets in the store will be mouldy. You cannot, absolutely cannot, just cut it out and continue using it or stir it in or anything. More work, but go to another store and check their batches. Also – open that new bucket and take a whiff. Remember the odour. If any bucket in the future, especially any you’ve been storing for any amount of time, smells distinctly different from that – throw it out. This goes for paint too. If it smells funny, it’s bad. Looks like mold also to me, need to get rid of the rest.Will be better in the long run. Good Luck!! !